Persona Non Grata: 'Toontime: Explaining President "Twit"
Wackydoodle sez: When 'Mericans elected him, they all didn't mean it! A siren should go off at the Trump Mansion (formerly 1600 Pennsylvania Avenue NW) when Trump says something he really, really means so 'Mericans can know the difference between his throwaway agitprop and his policy pronouncements. 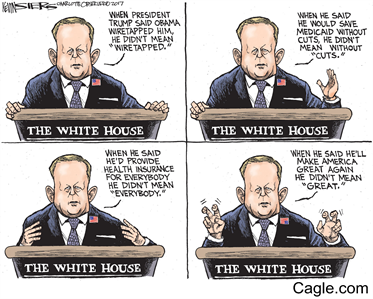 After four years of this, not even the white supremecists that voted for him will believe anything the White House says. In the biggest test of his credibility so far, his colleagues in the Congress failed to muster enough votes to repeal Obamacare, a major tenant of their so-called policy reforms. The fact is that conservative hard-liners (the House Freedom Caucus) refused to support any kind of legislation that involved federal intervention into the dysfunctional profit market for health insurance. Obamacare with all of its faults will be with us for "the foreseeable future" thanks to deal-maker in chief's failure to make a deal.